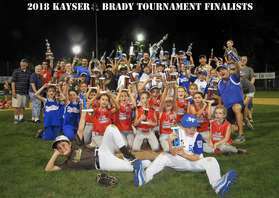 The KAYSER-BRADY TOURNAMENT is held annually in July, and is hosted by the Pearl River Little League and operated by the Billy Kayser Memorial Foundation and the Alicia Brady Memorial Foundation. It honors the memory of Billy Kayser and Alicia Brady and seeks to promote the friendship and sportsmanship that were characteristic of Billy and Alicia. The tournament was started in 2004, and 2018 will mark the 15th annual KBT. This year, we also honor the memories of KBT mainstays Bob Vitale and George Doonan (see below). The Kayser-Brady Tournament is held at the Anderson Fields complex. The Kayser and Brady families are grateful to Pearl River Little League for extending the use of their fields to the Tournament. See the "Parking" category in the left hand column for information and directions to Anderson Fields, and "Handouts" for a downloadable Parking Pass. ALL PARKING (except handicapped) IS AT THE VERIZON WIRELESS PARKING LOT. 7/26/18: REPEAT CHAMPIONS! STONY POINT DEFEATS WEST NYACK TO WIN ITS SECOND STRAIGHT KAYSER (BASEBALL) TOURNAMENT CHAMPIONSHIP, WHILE SOUTH ORANGETOWN DOWNS PEARL RIVER TO REPEAT AS BRADY (SOFTBALL) TOURNAMENT CHAMPIONS -- SEE SCHEDULE/SCORES AND GAME SUMMARIES LINKS BELOW. LINKS: (6/29/18: - see "Past Tournament " tabs for 2017 KBT info). (PHOTOS TO COME). See "Handouts" in left column for Tournament Procedures, as well as Parking Passes and Little League Tournament Rules Summary Charts for baseball and softball. SEE "PAST TOURNAMENTS" TAB ON LEFT FOR HIGHLIGHTS OF PREVIOUS TOURNAMENTS. The 15th annual Billy Kayser/Alicia Brady Tournament is almost upon us. Seems hard to believe. The time has gone so fast. What was once a tournament designed solely to honor the memories of two outstanding young people, taken from us too soon, has evolved into a County-wide celebration of the virtues of sportsmanship and friendship that Billy and Alicia outwardly displayed in their lives. Thousands of dollars in scholarship monies have been awarded to young people displaying those same qualities. To be sure, memories of Billy and Alicia still abound, but they are remembered not with sadness, but with joy and pride, and the focus of the Tournament is uncompromisingly to the future, and to the preservation of a game that can bring happiness and accomplishment, not frustration and disappointment, to our children. Too often, modern sports, even at the youth level, is played with a win-at-all-costs attitude that spreads to spectators and families, and engenders blame and poor sportsmanship. Billy and Alicia did not play the game that way. They interacted with their "opponents", and very often left a game with a new friend or two. If our tournament can help some of the players (and parents) adopt that approach, we can do honor to the memories of Billy and Alicia. 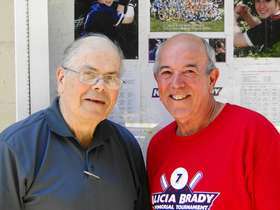 This year, we also pay tribute to the memories of two men who have been instrumental in the operations of the Kayser-Brady Tournament since its inception. Bob Vitale and George Doonan both passed away since the last tournament. Bob was one of the founders of the tournament, and played the largest role in getting the tournament going. Simply put, there would be no KBT without Bob. His fight against cancer sidelined him for the 2016 tournament, but he made a comeback in 2017, resuming his place as master of ceremonies for the post-tournament awards. George Doonan, of course, was our beloved announcer, the long-time "Voice of Kayser-Brady", as well as the "Voice of Pearl River Little League. We miss them both deeply, but their spirits, along with those of Billy and Alicia, will help us in the tournament's mission of spreading joy among this year's players and families. See Photo below. See also the individual pages dedicated to Bob and George (click on names above or use the "News" tab on the left side of this page). 2017 Stony Point L.L. South Orangetown L.L. 2018 Stony Point LL	 South Orangetown L.L.